Q. 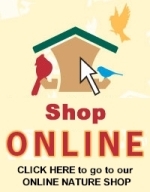 Why should I feed mealworms to the birds? A. Many birds eat insects naturally, so feeding mealworms to the birds seems like a natural thing to do. And while doing so, you'll be able to observe fun and interesting bird behaviors! A. Mealworms are the larvae of the beetle Tenebrio molitor. This larvae stage typically lasts for 10 weeks. A. Some people think that if you don't have bluebirds, there's no reason to feed mealworms. But even if you don't have the right habitat for bluebirds, many other birds will enjoy them, including some of our most beloved feeder birds. We've had chickadees, nuthatches, and titmice eat mealworms from the feeders at our house. Other birds that eat mealworms regularly include wrens, orioles, robins, woodpeckers, and some warblers, like the Pine Warbler pictured right. Based on material provided by WBU, Inc.
Mealworm and warbler images from WBU Inc. Image Library. Anita, birds definitely prefer LIVE mealworms. They are alive and juicy, providing moisture as well. Dried mealworms are dead and dry. It's easy to understand their preference, isn't it? So far no bird has come for the dried meal worms. I just put it out September 1. May be too late to attract. They like the wild bird feed however. I'm in Pensacola. I absolutely love watching the Robins from the time they return in early spring till the time they leave in late fall. When one pair decided to nest at my door 2 years ago, I went so far as to block off the entrance to all humans for 2 months! My male loved the super worms I'd put out for him and responded to my whistle by perching himself ontop of the rain spout curiously anticipating the bowl of worms. No sooner did I turn my back, he'd dive down digging into the bowl. He'd even leave 1 or 2 for the female and call her over to enjoy the treat. I was able to watch the pair raise their young and lucky enough to catch the moment they all left the nest in a quick flurry of activity (almost like the parents whistled on your mark, get set, go)! I saw them a few times after that around the yard but later in the summer, they seemed to have moved on. I was very excited to see the male reappear last year and although I didn't have any nests near by, he still showed up for his worms. This year however I was disappointed when I hadn't seen my Robin reappear. I did have Robins but the big guy with the large tuff of feathers ontop of his head and responded quickly to my whistles was no where to be seen. Needless to say, I was saddened by the thoughts of what could of happened to him. Last month I did notice a similar male (large tuff of feathers in his head) hanging around and a couple of weeks ago discovered a nest of 4 beautiful blue eggs in the bushes of my front yard. They've all recently hatched and I look forward to enjoying them. I know this is not the "my" male but I'd like to believe it's one of his offspring returning to his birth place to start his own family! I've just received a new batch of super worms (1000 for now) which my new Robin family truly appreciates! He hasn't yet figured out that the whistle means food but I have no doubt he'll get it soon enough! Catherine, it's hard to tell what caused their demise. So many things can impact success including food, heat, parents experience or demise, predators, insects, etc. I will tell you that live mealworms are always preferred over dried; birds prefer them, and they provide need moisture as well. Also, be aware that most dried mealworms are shipped to this country from China. Hi. I recently had some sparrows nesting in my mailbox. I fed them some dried mealworms (that I have for my hedgehog). They seemed to like them, but about 1 week after I fed them these, all three of the babies died! I am horrified that I may have contributed to this. One of the babies was underweight and sickly, but the other two seemed to be doing well. All of their crops seemed full when I found them so now I am scared that the dried mealworms somehow harmed our little sparrow babies :( Any ideas? Ralph, they may eat them, but they would always prefer live. They also get vital moisture from live mealworms that they don't get from dried mealworms. Chickadees go WILD around here for dried mealworms! Barb, they definitely prefer live mealworms. They may eventually eat dried ones, but get more hydration and nutrition from live ones and they know it! I just bought a feeder and dead meal worms but the bluebirds will not eat them! They prefer live ones? Deb, sure there are mail order suppliers out there, and they have their pros and cons. But if you can get them locally, I hope all my readers here would choose to support their LOCAL businesses, which contribute to the community, provide jobs, etc. Local businesses go out of business without the support of local citizens. Research your mail order companies because there are good ones out there. It's been several years since I bought them this way, but I had good experiences with it. They were much cheaper than what I could buy locally because I bought a lot at a time. Just be sure you are going to be home when they arrive because you don't want them left out in the sun. If you can't be home for delivery, then it's not a good way to go. Patricia, sometimes it takes birds some time to find and then become interested in a new source of food. Try again when bird activity is good, try putting the feeder in the place of another feeder that gets heavy use, and make sure you're using live mealworms (not dried or roasted). Put out only a pinchful until they start feeding. Jill, I appreciate and understand your thoughtful question regarding feeding mealworms to the birds. The good thing is that mealworms are not the only options for feeding the bluebirds, so if one has ethical or other concerns with it, we can pass on that form of food. Thanks for leaving your thoughts! I cannot get birds to come to my mealworm feeder. Any ideas? Mealworms are the larvae of the Darkling Beetle, which are a pest near stored grain. I don't suspect a few would be of much concern in a typical yard. Every once in a while a mealworm falls to the ground. Is there any concern about it surviving to become a beetle, and is the beetle problematic? Q1. How high should I fill my little mealworm feeder for my birds? I bought the WBU square, clear plastic one and 2 small containers, which I'm told should last a while. Q2. Also, does it matter if any of the wheat gets into the feeder with them? Q3. Should I take care not to touch the worms with my fingers and just tap them from the container into the feeder? A. THere's absolutely no harm in touching the mealworms. Q4. 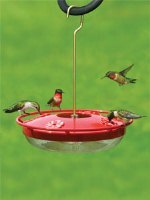 One more thing: Where should I put the feeder itself on the pole system? Can it go just above the baffle? A. Anywhere above the baffle is fine. Good luck getting your Carolina wrens!! Kelly - glad to help you with mealworm feeding! John - thanks and good note to beware mail order. It can also get very expensive that way during the summer when shipping costs are HUGE! If you get them at a WBU, we bear the cost and the hassles! Also beware of mail order mealworms. I'm not saying that all mail order is bad, but we got burned twice by two different companies.